Home / Our People / Faculty / Radio, Television, and Digital Media / Jay Needham M.F.A. Jay Needham is an artist, teacher, radio producer and composer. His sound and visual works address the politics of borders and the aesthetics of acoustic reception. His compositions activate listening as an irreplaceable component of an artistic cognitive process. Needham's current work advances the critical placement of radio and the transmission arts as one of the most persuasive contemporary forms of cultural communication. 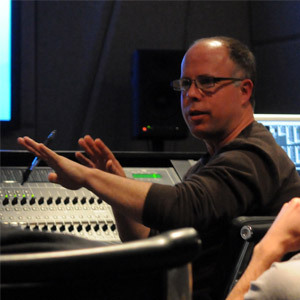 He teaches courses that encourage students to create compelling original sound works for radio, film and television. Courses such as Sound Art and Practice II (RT463) and Sound and Moving Image (RT496) offer students the opportunity to integrate strong creative concepts through the use of state of the art sound technologies. Professor Needham also teaches studio courses in electronic arts in the Interdiciplinary MFA program. Needham's sound art and radio productions have appeared at museums, festivals and on the airwaves worldwide including: AV Festival, dlux, Electronic Language International, Electrofringe, Flux, Las Cienegas Projects, Los Angeles Contemporary Exhibits, Radia LX, RADIOPHONIC, Steppenwolf Theatre, Tesla, VIBGYOR, Videologia, WAVES/RIXC, WBEZ-FM, WETA-FM and the Wexner Center for Visual Arts. Needham holds an MFA from The School of Art at California Institute of the Arts. Sound and radio art, sound and moving image, documentary radio, electro-acoustic composition and performance, media theory, acoustic ecology, sustainability and the history of science and technology.